Catcher, Louisiana, and Jonathon Sawyer helped children select their ingredients from the noodle bar. 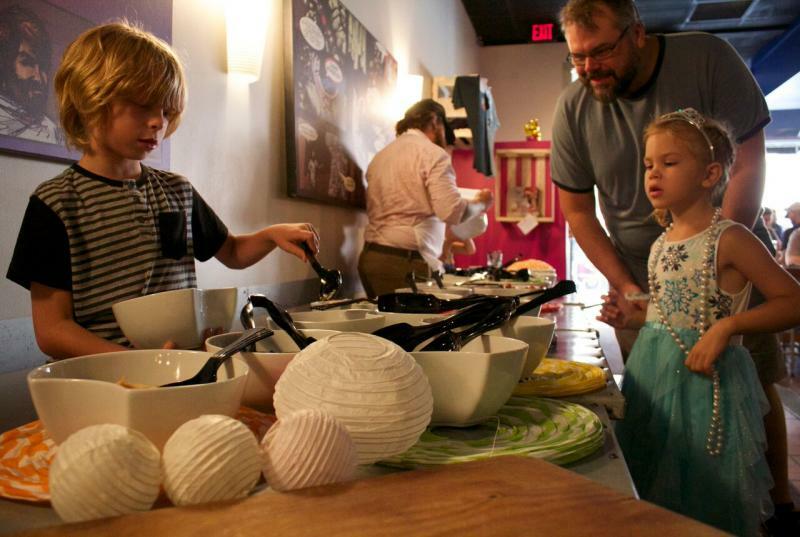 If you’ve resolved to spend more quality time with the kids, a Cleveland chef has some advice. Use your noodle to coax them into the kitchen. WKSU’s Vivian Goodman has the story in today’s Quick Bite. 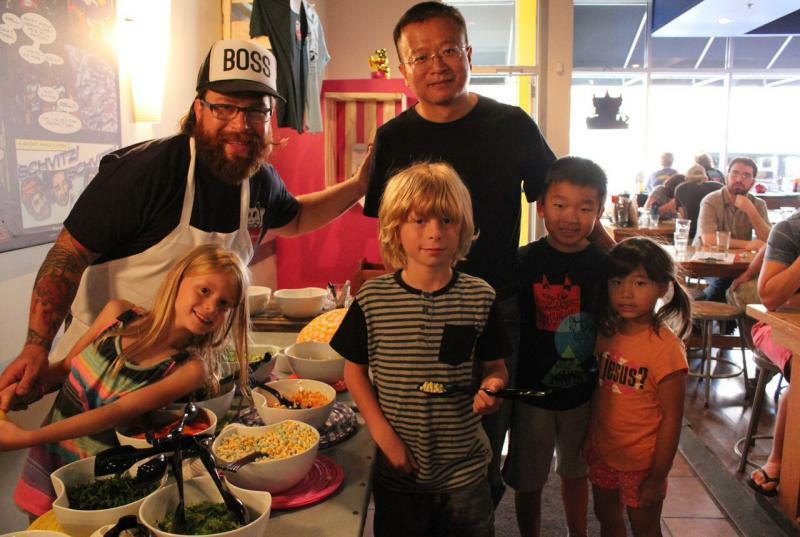 Chef Jonathon Sawyer welcomes parents and their kids to Noodlecat, his downtown Cleveland restaurant. It’s inspired by Tokyo ramen shops and New York City noodle houses. Today, it’s party-central for the whole Sawyer family. “I’m Amelia Sawyer. This is Louisiana Sawyer and that’s Catcher Sawyer." Catcher is 10. Louisiana is 7. “Lou, would you like to tell her what we’re doing?” her mom, Amelia, inquires. Parents and kids bring empty bowls to a long table laden with edamame, freeze-dried peas and corn, curly kale, seaweed, scallions, poached potatoes, confit of pork, char siu bacon, hotdog octopus, poached chicken, tofu, peanuts and cashews, spicy red ginger, sesame seeds, miso, crispy shallots, garlic and seaweed. “Seaweed? Can I have one?" asks Sawyer, sneaking a snack while his kids ladle out ingredients. 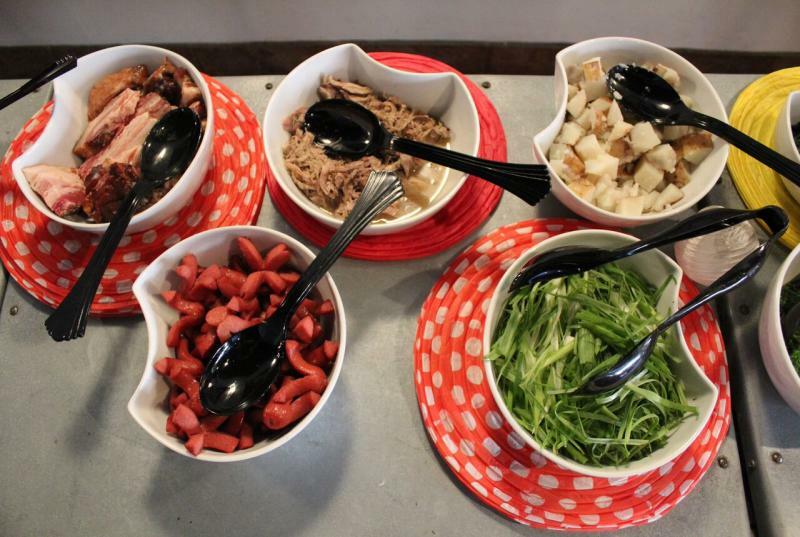 Once the kids pick their proteins, vegetables and condiments, broth and ramen noodles will be added. 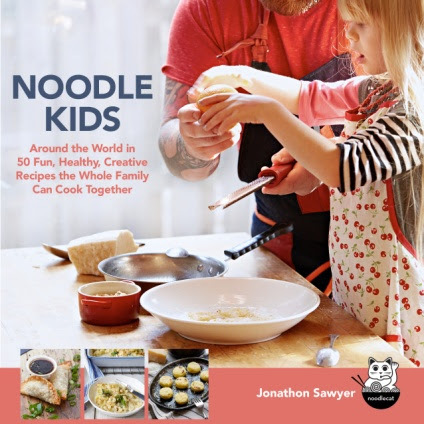 The event is to promote Sawyer’s new cookbook, “Noodle Kids.” And to further his mission of encouraging adventurous eating. 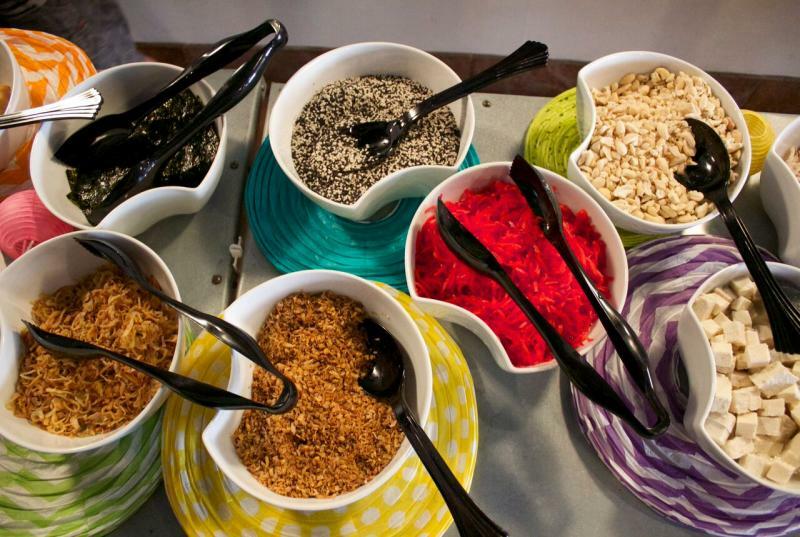 There’s only one rule today: Each bowl has to have at least two vegetables. “I could have a beer, though, right?” And she can. The Sawyer kids want their dad to tell a joke. “Dad, say something that the Noodlecat would say,” Catcher prompts. Louisiana complies, “I don’t know. What are the best men?" Ryan Fisher of Tremont brought 3-year-old Wren to the party. “Wren, do you want to try an edamame?" At 3, she’s not a picky eater. Kim Miller of Cleveland is here with 5-year-old Simone. 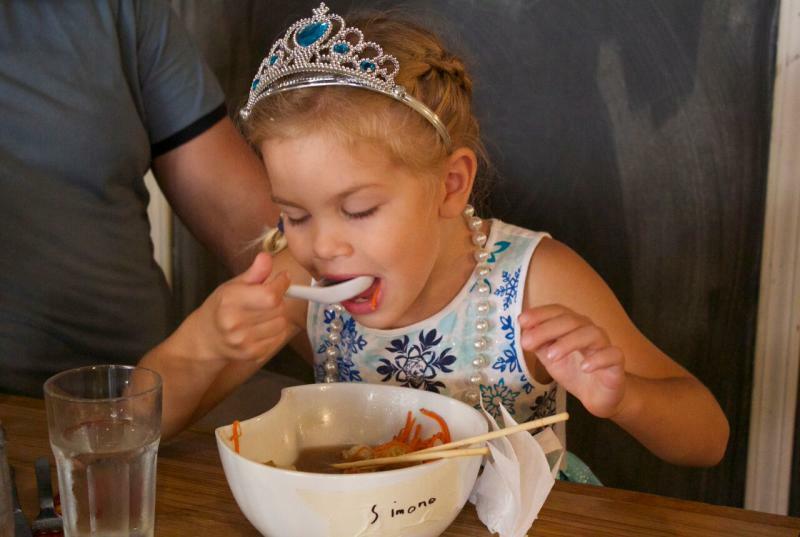 Chef Sawyer wants more parents to use their noodles. “How many pieces of bacon do you want?” Catcher asks Nicole.“The pieces are really thick so, just one,” Nicole replies. 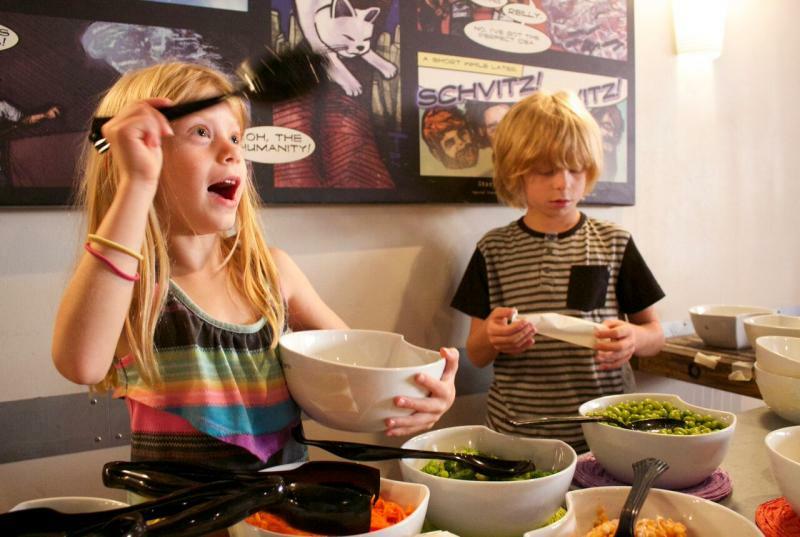 It’s no surprise that Chef Sawyer’s kids, Catcher and Louisiana, will eat almost anything. “Clams are like my favorite seafood, so, yeah," says Louisiana. Chef Sawyer is proud of her affinity for clams. Catcher can cook his favorite vegetable all by himself. At present, he has no plans to be a chef like his father. But she had to try them. Even her mom has to try whatever Chef Sawyer cooks. The James Beard award-winning chef says it’s easier to get them to try, when you let them help cook. The chef says you can ask kids to help clean up, but while they’re cooking don’t expect them to be tidy. Jonathon Sawyer owns two other restaurants and a catering service, but now that he’s a dad, he doesn’t work nights anymore. But at the Sawyers, family time mostly happens when they get together to cook.